!!! ALERT: SPECIAL MODE DETECTED !!! 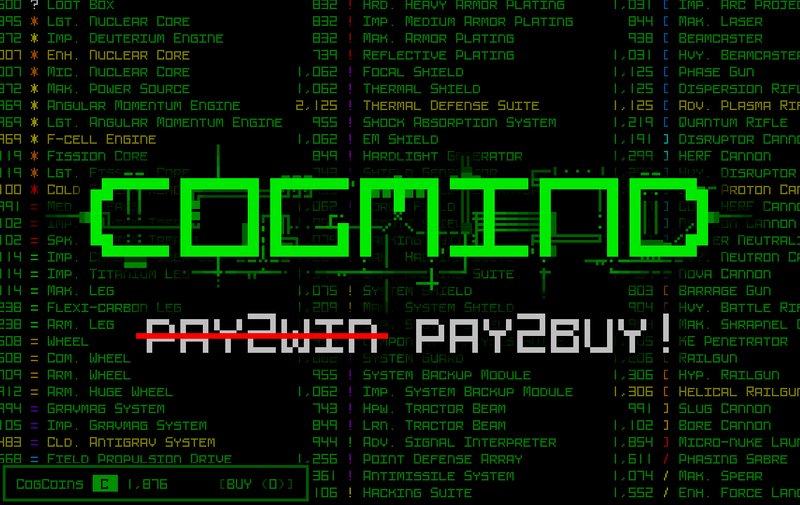 Get the latest Cogmind update and fire it up on April 1st, and anyone who's past the tutorial starts and has been playing the regular game will automatically have new runs start in Pay2Buy mode! AFD 2018 was a last-minute joke implemented and deployed in just an hour on 2018.4.1. This year I put a good bit more time into it, spending several days over the past week building some new UI features, designing and balancing systems, and surprisingly increased Cogmind's core code base by 0.6% for Pay2Buy alone (excluding all the other work that went into bringing you Beta 8.1). The Cogshop is open for business! 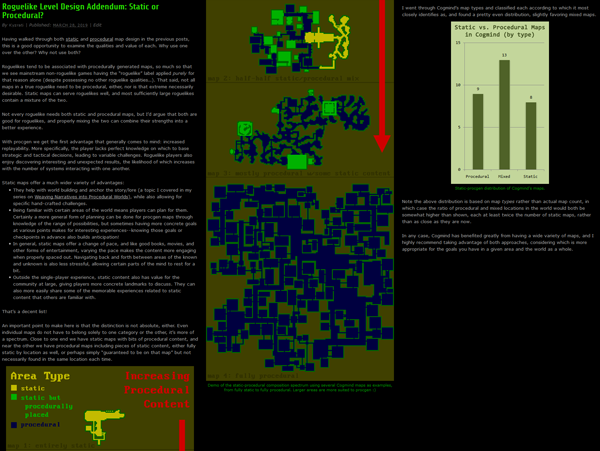 No, this isn't the Merchants Guild expansion I've touted as one of my Patreon goals, it's a new AFD mode that significantly changes the Cogmind experience. Skip this section if you want to go in blind, or read on for more details. In Pay2Buy mode there are no parts lying around, and no salvage from kills, either. In a few very rare cases items may still be available via the usual special means, e.g. Relay Couplers, but for the most part you'll have one source of new parts: the Cogshop. Access the shop by clicking on the Buy button in the bottom-left corner, or via the number '0' on your keyboard. There is no item info available for shop items--there wasn't enough time to add that, although I did add the short item stat summary after each one so you can reference that to help make purchasing decisions. Earn CogCoins by doing almost anything that raises alert, i.e. get in fights -> earn coins -> buy parts -> get in more fights (or go around sabotaging machinery as your source of revenue ;)) and so on. Eventually you might notice there's a bit of a market economy going, with you as its only customer :P. Prices will fluctuate a bit, more so depending on what you do and don't buy. Item types you don't buy will get lower in price, while those you do will get increasingly expensive. There are also Loot Boxes! Because of course there are :). If you've got coins to spare or want to take a risk, test your luck and buy some. You might also see some special discounts or other shop-related announcements as you play. As for other AFD-related tweaks, you do not have access to any Storage Units, but start with ten inventory slots for free, instead of the usual four. Your score sheet at the end of the run will include a full list of all of your purchases, and the prices you paid. 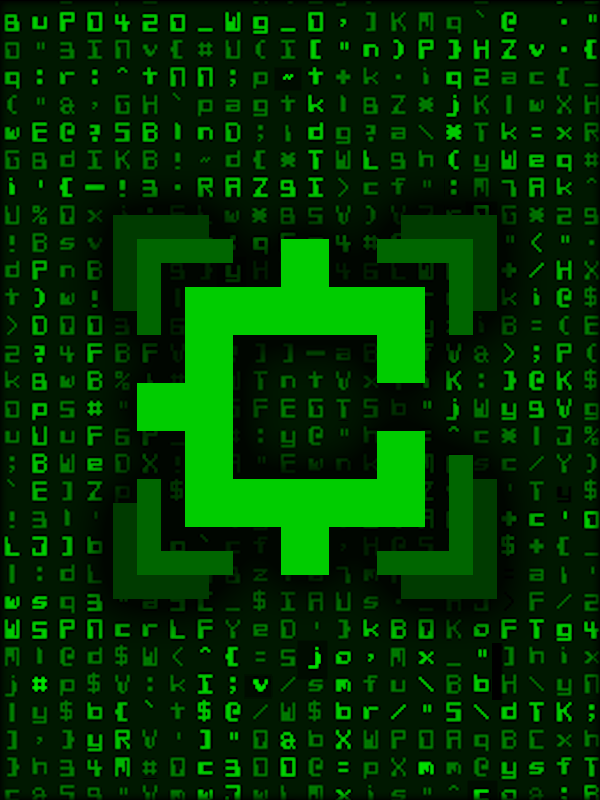 And in a very first for one of our Cogmind special events, score sheets can actually be uploaded! (assuming you have the option enabled) Of course they won't be included in the regular leaderboards, but Pay2Buy runs could get their own dedicated event leaderboard, at least for those who play in the near term. AFD 2019 normally autoactivates for new runs on 4/1, but if you want to play on another day, rather than having to change your system time like before, I've added a new option you might prefer, the "-forceAFD2019" command line parameter. (In Steam this is Cogmind > Properties > Set Launch Options...) If you don't want to play this special mode on 4/1, the "-noAFD" switch will block it. There were various other EX tweaks as well, mostly small stuff. One of the other big changes under the hood is probably not so big to most players, but the entire turn system has been replaced with a new type of queue. I'll be covering this more on the dev blog later, but the main impetus was to prevent free corner peeking, which a tiny handful of players were taking advantage of as an optimal tactic made possible by gaming the original turn time system. Now the system is more fair, and directly related to movement speed, rather than specifically when during a turn the move action is taken. In the process of making the above change I also optimized the turn queue handling, which will speed up the game by up to 10% in some scenarios. On the blog I've shared an addendum to my level design article, this one discussing how I approach layout planning for procedural maps, with an eye towards level design goals. Another addendum, looking at the usage of static, procedural, and hybrid maps, is currently available to patrons here. In good hardware news, I successfully cleaned out my dev laptop, as well as recovered all parts taken by Recyclers that escaped from the Cogmind source in the process. 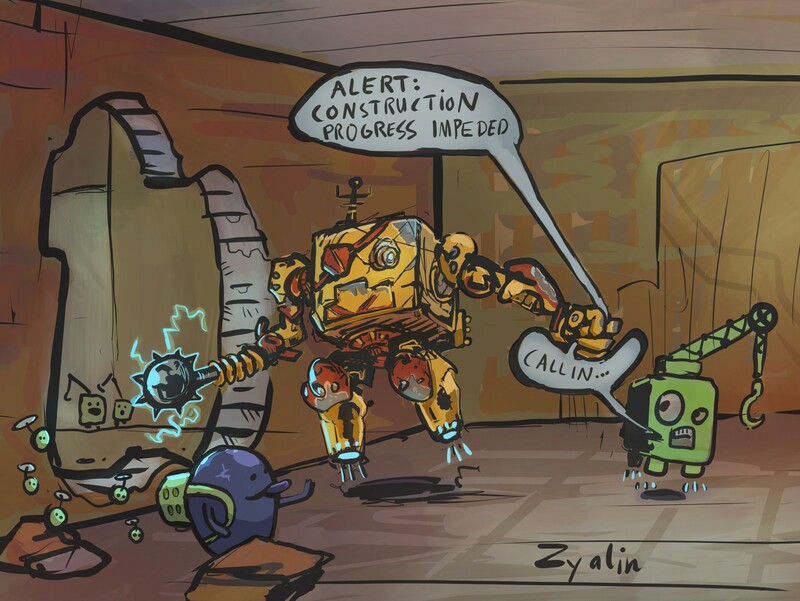 Zyalin has shared some cool new fan art, this piece titled "Storage Jammin'"
Over on the forums muxecoid started a poll for the most hated combat enemy class, and Hunters won by a fair margin. Swarmers came in second place. As for myself, on my Twitch channel I've been streaming a bunch of 7DRLs for reviewing lately, but will get back to Cogmind soon. In fact, it won't be this week because I have family visiting, but next week we're gong to play with Pay2Buy mode! As usual the videos will be up on YouTube afterwards. 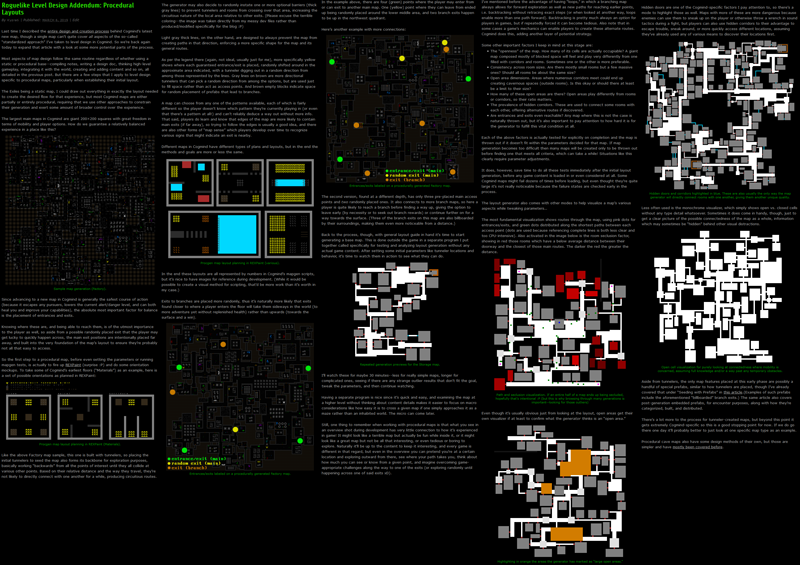 Patreon is going okay, the one I announced last time as part of the Future of Cogmind update. So far patrons have been submitting suggestions for my Cogmind TODO list prioritization, to decide which major QoL system they'd like to fund for Beta 9, and also more recently for the new item/mechanic they'd like to see in the next release. These things are collaborative so we'll be doing some voting in April. Well my near-term plans have somewhat changed due to this whole Pay2Buy event. I was originally planning to release a Beta 8.1 with fixes and some new hacking content, but Pay2Buy got big enough that it pushed back the other stuff (and 4/1 is a hard and fast deadline, after all xD), so my earlier 8.1 plans are likely being folded into Beta 9 instead (along with all the other Beta 9 stuff). So the next release will likely be Beta 9, though it's too early to say when that'll happen since there's a lot to do. That said, Beta 8.1 is pretty big for a "minor" release, and the new mode adds yet another layer of replayability, so I'm looking forward to seeing what everyone thinks of it. Beta 8.1 saves are not compatible with previous versions, but even if you're on Steam and Cogmind automatically updates, Beta 8 is still available via its own legacy branch and you can roll back to finish a run in progress first if you like. I'd love to hear back from them, but stopped bothering for now since I already sell DRM-free direct anyway. Probably the coolest and most clever use of Ascii ever? Going to be keeping my eye on this one. Lets push this project into the top 100 indie games of the year! Don't forget to vote people! Cogmind made the top 100 last year, and that's before it was even released, so I'd be disappointed if we couldn't do at least that well now that so many are enjoying the alpha! HOLY ****. Like, usually I wouldn't go for profanity and caps lock to voice my opinion, but the latest round of gifs are seriously good. 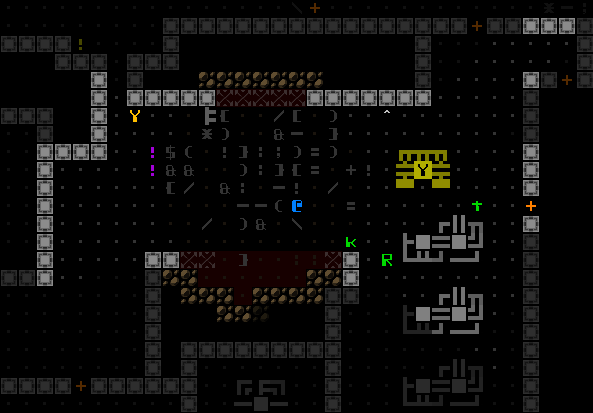 I haven't really played a roguelike of this old style since I sank hundreds upon hundreds of hours failing at Nethack. This revitalizes my love of this genre. 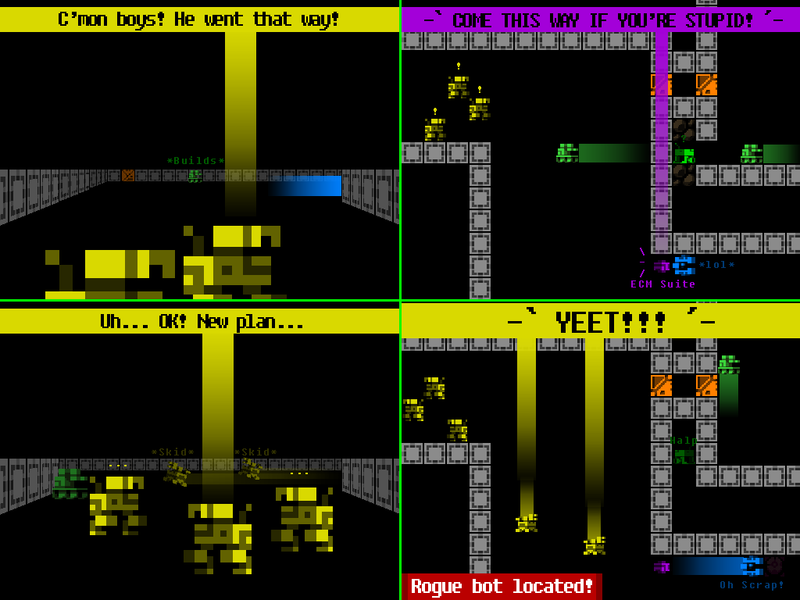 Like... in the mainstream, roguelikes have been being updated and reworked for current sensibilities by taking the ideology of the old school and applying it to new things. FTL for instance checks a bunch of roguelike boxes but is still a totally different beast. Permadeath, random generation, hard decisions and that high learning curve. It's a great game and probably my favourite to come from this permadeath resurgence. This looks to checks all the same boxes, but it looks like it applies that ideology right back into the source genre? And with all the style and panache available. It's looks like everything I loved about old terminal rpgs, but what I imagined them to be rather than what they were. And I love that. The full gamut of colour and the incredible UI are wrinkling my brain with anticipation. Goddamn I am psyched. Keep up the amazing work! With regard to what you "imagine," that's exactly where I'm coming from! When I started working on this the whole idea was to produce this world I was imagining where the interface really comes to life, kind of like a mash-up between roguelikes and Hollywood terminal UIs (but where everything actually means something!). This approach doesn't make much sense with fantasy, the traditional roguelike setting, but with sci-fi it's a natural fit. My brother was watching the (unreleased) trailer in his office recently and some co-workers came by and thought he was programming on some awesome new terminal, haha. Alpha Access launches next week Tuesday if you're interested :D. The announcement will probably come to IndieDB a little late. I just added that composite gif today since there wasn't anything yet showing off the tileset, and I have that one as the new lead gif for the updated website (not yet live).